The gourmet season is upon us and I have a crunchy delicious snack for you! John Wm. Macy’s CheeseSticks are a delicious and all-natural addition to your roster of snacks to serve your guests. They are light, crunchy, a wee bit spicy, and won’t ruin their appetites before a big meal. I like them because they are a gourmet upgrade from a boring plain cracker. They are made with real cheese such as asiago and cheddar and have no artificial colors or preservatives. For only 90 calories for 2 large CheeseSticks, they are a great alternative to the heavier snack option of cheese and crackers. They are also really pretty, so they dress up any platter you create. John Wm. Macy creates three types of crispy snacks. The CheeseSticks come in Original Cheddar, Melting Parmesan, Dijon Swiss, Garlic Romano, and Cheddar & Scallion. There are CheeseCrisps, which are in a square shape, and include Asiago & Cheddar, Smoked Jalapeno, Melting Romano, Garlic Parmesan, and Sesame Gruyere. Finally, there are gourmet dessert snacks called SweetSticks including Dutch Chocolate, Madagascar Vanilla, and Java Cinnamon. These pair well with coffee or tea and are like a long cookie. Buy John Wm. Macy’s CheeseSticks Online or look up a nearby retailer here: Where to Buy. John Wm. 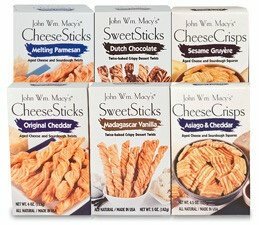 Macy’s CheeseSticks is giving away two sampler packs (see photo above) to two lucky Snack Girl readers. Please comment below on what you serve as a gourmet snack during the holidays. This is a sponsored post written by me on behalf of John Wm. Macy’s Cheesesticks. A John Wm. Macy’s CheeseSticks sampler pack valued at $19.99. Comment below on what you serve as a gourmet snack during the holidays. This giveaway is offered to residents of the USA (except Hawaii). One randomly chosen winner will be announced on Tuesday, November 3rd, 2015. Hm. About as gourmet as I get is a nice veggie tray during the holidays. These snacks sure would be a pretty and tasty accompaniment. I'm not the "go-to" person for appetizers. I do make beautiful veggie trays/sculptures for holidays and special events, often with a variety of crackers as a side. I'm anxious to try John Wm. Macy’s CheeseSticks and SheeseCrisps. Cocktail bread toasted and spread with a mixture of mayo, minced onion and parmesan cheese, put under the broiler until bubbly. Always a hit. Not very gourmet but deviled eggs are always a hit. I love making chutney for the holidays and serve it along with crackers and cheese. Cream cheese with red pepper jelly is also our family favorite. My go to gourmet snack I'd spinach parmesean balls. So yummy and healthy! I would love to try these cheese sticks! They look amazing! Bacon wrapped water chestnuts with barbecue sauce. Not exactly gourmet but..... I can't wait to try these. I love anything cheese and crunchy. In my house, it's not a holiday without shrimp and cocktail sauce. Home made Salsa and Chips are a regular at holidays in our home. However, I love the idea of cheese sticks as a more sophisticated treat. Spinach dip in a deep bowl surrounded by cheese sticks. 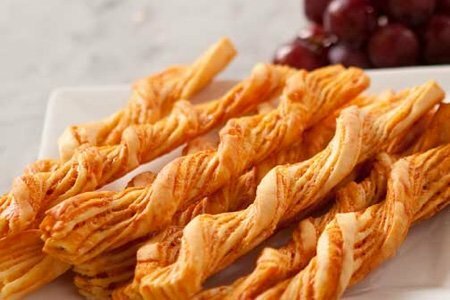 I love appitizers at holidays...dips and crackers..cheese balls and fruits...these cheese straws looks great..really want some.. I usually like to do a veggie tray but have a nice spicy dip or salsa. Also I like to make cookies but use applesauce instead of the butter although the ones made WITH butter are WAY better. Hey, it's the holidays right?